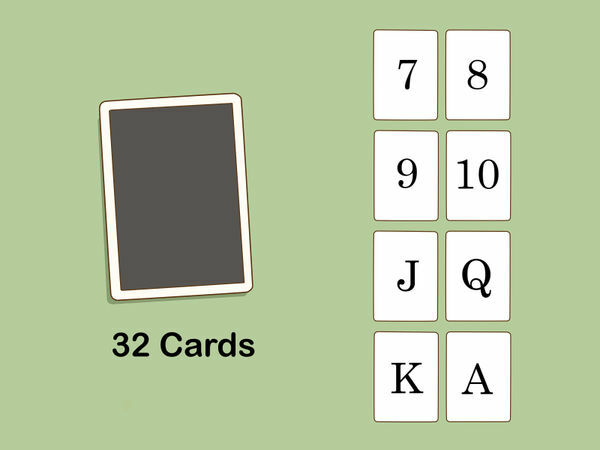 Belote is a classic 4-person card game, played with a deck of 32 cards. 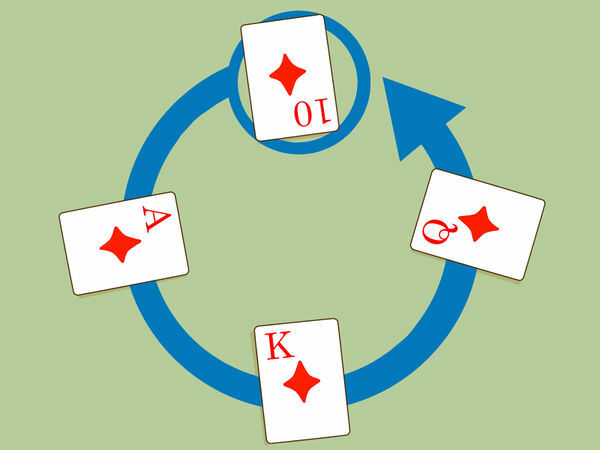 Like many card games, Belote can seem complicated if you’ve never played it before. The rules and terminology of the game can be especially confusing. There are also countless versions of the game, with different versions being popular in different parts of the world. Learning the basic rules and scoring methods doesn’t take too long, though, and once you know them, you’ll be able to pick up other variations of the game quite easily. Find 4 players (including yourself) to play. Have the partners sit at opposite sides of the playing area. 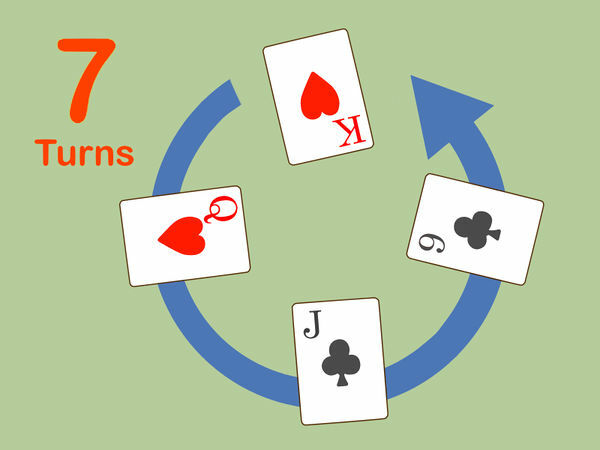 Pick out the 7s, 8s, 9s, 10s, Jacks, Queens, Kings, and Aces in a classic deck of cards. Make sure you have 4 of each card, 1 from each suit. The playing deck for belote includes 8 cards per suit (diamonds, hearts, spades, and clubs). Designate 1 player as the dealer and have another player cut the cards. The players can look at all their cards upon receiving them. 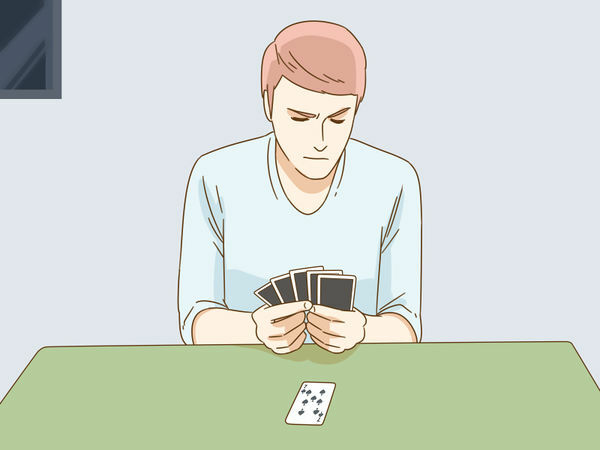 After dealing, set the 12 cards remaining in the deck face down. This card is known as the trump card. Its suit will become known as the trump suit if a player takes the card during the bidding, which is explained below. For example, if the trump card is an 8 of hearts, the trump suit will be hearts, if a player takes the trump card during the bidding. The player to the dealer’s left goes first. If the player accepts the trump card and adds it to their hand, the suit on the card will become what is known as the trump suit for the game. 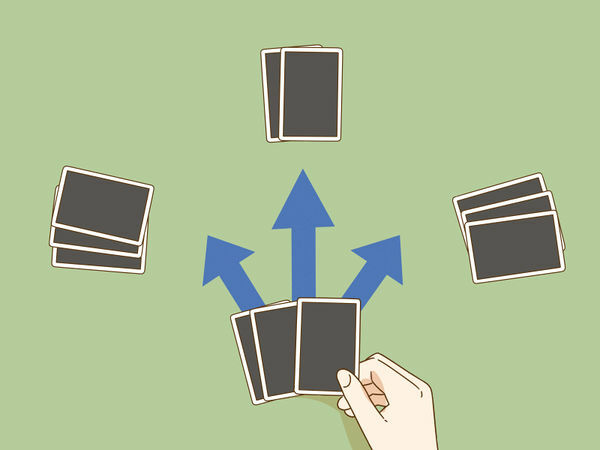 If the player decides not to take the card, the next player to their left can choose to take it or pass and so on. This process is known as the bidding. Take the trump card if you have a Jack, 9, or Ace of the same suit as the card. These 3 cards are worth the most points in a trump suit. For example, if the trump card is an 8 of hearts, take it if you have a Jack, 9, or Ace of hearts. If all 4 players decline to take the trump card, the first player has the option to choose 1 of the other 3 suits to be the trump suit and take the card or pass. If the first player decides to pass, the next player can then choose another suit or decide to pass, and so on. 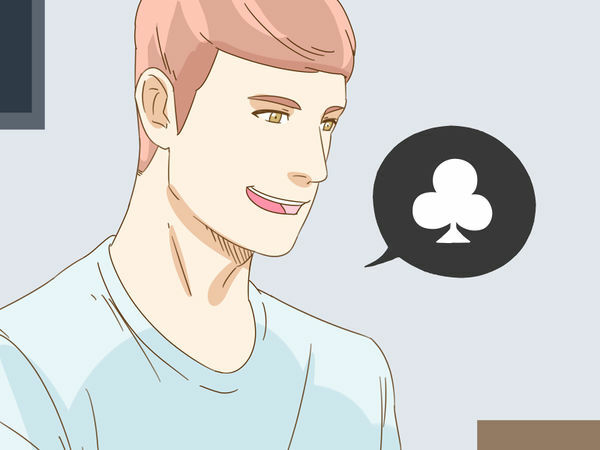 For example, if you have a Jack and Ace of spades, you might want to take the trump card and choose spades as the trump suit, since you’ll have a good shot at a high score if the trump suit is spades. 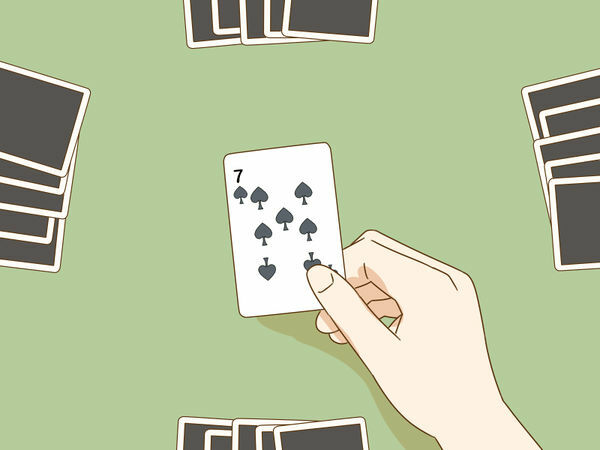 If you don’t have a Jack, Ace, or 9 in any hand, however, you might want to pass. The trump card, however, will still retain its original suit. If no player takes the trump card during this second round, collect all the cards that were dealt, shuffle, and then redistribute them. Deal the cards 1 at a time. Give 2 additional cards to the player that took the trump card and 3 cards to each of the other 3 players. Once you’ve done this, you can begin the game. 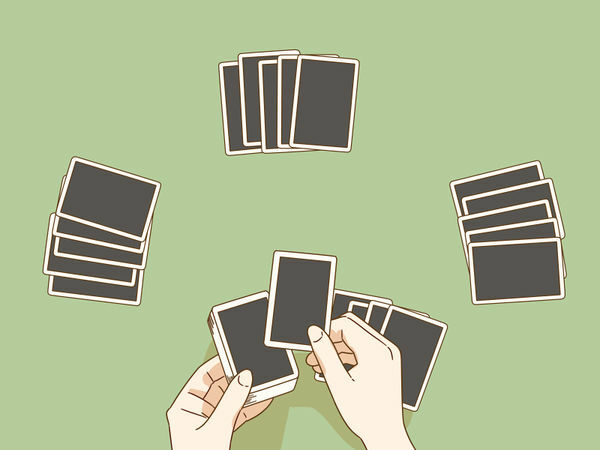 Make sure each player has a total of 8 cards in their hand before starting to play. 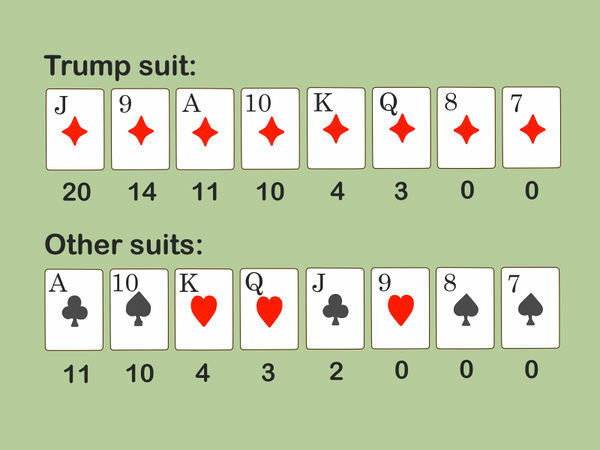 In the trump suit, the point values of the cards are as follows: (Jack = 20), (9 = 14), (Ace = 11), (10 = 10), (King = 4), (Queen = 3), (8 = 0), and (7 = 0). In the other suits: (Ace = 11), (10 = 10), (King = 4), (Queen = 3), (Jack = 2), (9 = 0), (8 = 0), and (7 = 0). The combined point value of all 32 cards is 152. When playing, aim to win the higher value cards, and play the lower value cards in your hand when you know the other team will win a turn. The player can choose any card of any suit. The other players then must each put down 1 card of the same suit. This turn is known as a “trick.” If you don’t have a card from the same suit in your hand and a player from the other team has played the highest value card, you must play a card from the trump suit. If the trump suit is hearts, for example, you would have to play a heart. 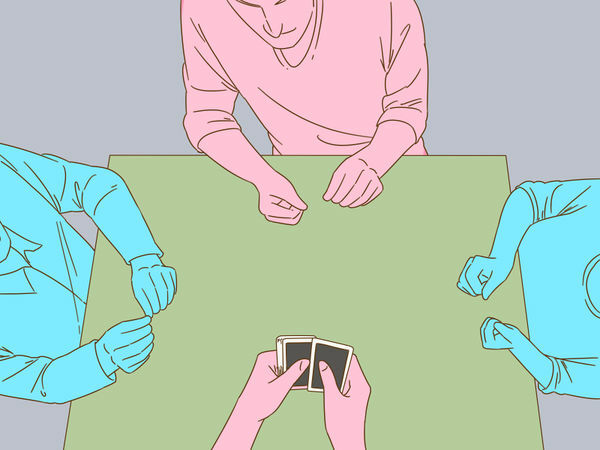 If your partner has played the highest card, however, you can discard any card. If you don’t have a card from the trump suit (hearts), play a card from another suit. If you find yourself in this situation, you cannot win the trick, and should try to put down the lowest value card in your hand. If the player puts down a card from the trump suit (hearts), you must, if possible, put down a card from the trump suit (hearts) that is of higher value. When you have the king and queen of the trump suit in your hand, play them as you normally would. 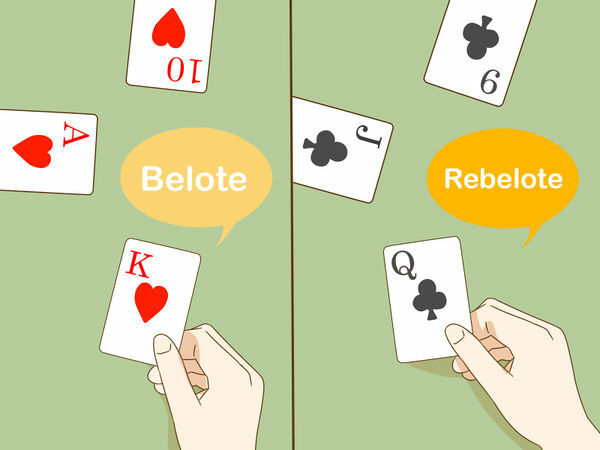 When you play the first card, however, say “Belote.” When you put down the second, say “Rebelote.” The team that declares a Belote and Rebelote earns a 20-point bonus. You only need to say Belote and Rebelote if you have both cards in your hand. If the trump suit is hearts, for example, you would say Belote and Rebelote only if you both have the king and queen of hearts. Continue playing until you’ve used all the cards in your hand. The player who plays the card of the highest value during each turn wins the turn (trick), takes the cards, and lays down a card from their hand to begin the next turn. If the team that took the trump card at the beginning of the round (the contract team) wins 82 points or more, they win the round. If this happens, both teams record the points they won during the round. If the contract team fails to reach 82 points, the other team wins all 162 points and the contract team wins 0 points. The team that wins the last turn of a round scores a 10-point bonus. The highest possible score in 1 round of belote is 162, which is the combined point value of all 32 cards (152) and the 10-point bonus for the last turn. 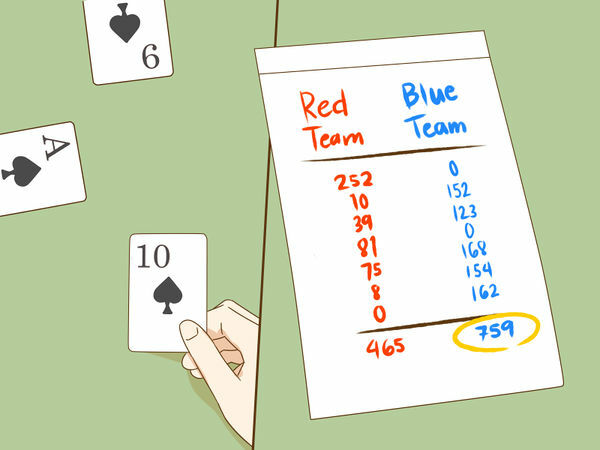 If a team declares a Belote and Rebelote during the round, the contract team must reach at least 92 points instead of 82 points. If 1 team wins all the turns (tricks) in a round, they receive a bonus of 90 points, for a total of 252 points. 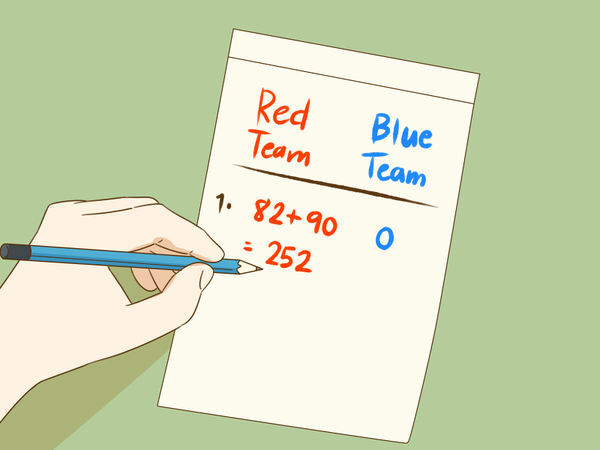 Use a pen or pencil and a piece of paper to keep track of the number of points each team scores in each round. Once you finish tabulating scores from the first round, start another round the same way you set up the first. Play and score the round in the same way as well. If both teams pass the 501-point threshold in the same round, the team with the higher score wins the game.